Richard Paul Ivy says he served in the Army during Vietnam. 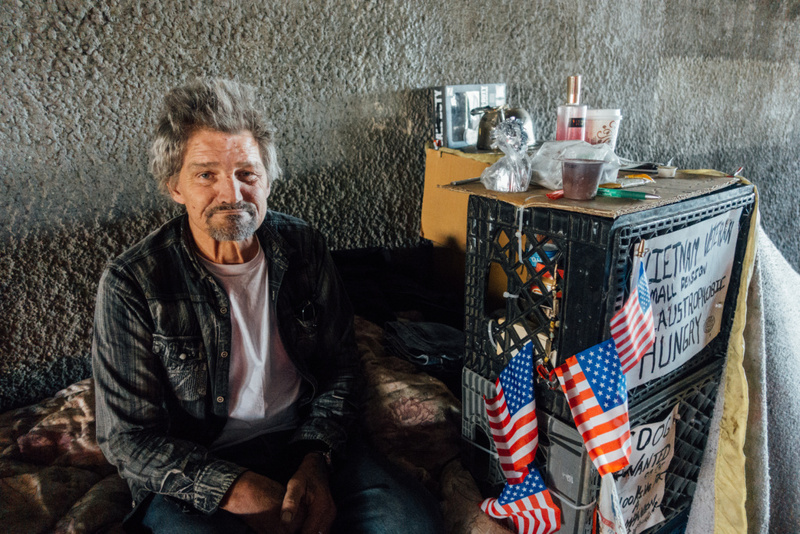 He lives under the 405 on Wilshire Boulevard, steps away from the West LA VA campus. On his way home on a recent Saturday afternoon, Richard Paul Ivy, 60, pushed a walker that doubled as a storage cart for his belongings. He was headed for a bed on the sidewalk next to Wilshire Boulevard, beneath the 405 Freeway overpass. "It’s nothing super duper or anything but it’s a bed and blankets," Ivy said. The Army veteran, who said he drove small armored vehicles during Vietnam, now camps just a couple hundred feet from the VA Medical Center in West L.A. You can see the campus from his bed. Ivy said this access to medical care is the only reason he’s alive. Ivy said he stayed at the VA for about 7 weeks. "They take real good care of you around here. They really do. I gotta commend them," he said. Then, Ivy was back on the street. He said living on the campus isn’t for him. "I feel too confined. I like my freedom," he explained. Ivy is one of more than 4,800 homeless veterans living unsheltered in Los Angeles County, by last official count. For decades, the West L.A. VA offered no solutions to Southern California’s mounting homelessness crisis. It took a long legal battle by homeless and disabled veterans, but there are now big changes in the works. 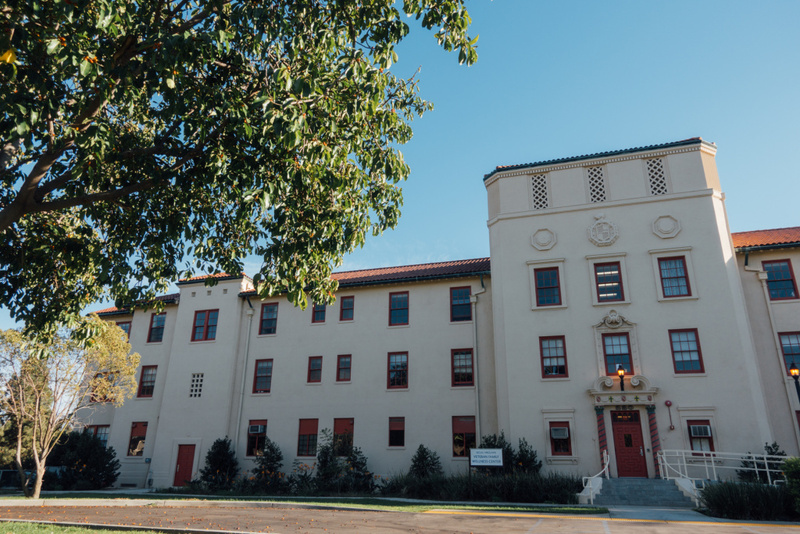 A Draft Master Plan to revitalize the site is moving forward and a small number of veterans are already living in permanent supportive housing on the campus. The plan is ambitious, and there are major questions about who will pay for it, and how quickly more than a thousand units of housing will materialize. But advocates say there’s optimism about new leadership in charge of implementing change, and the decision by the City of L.A. to chip in some of the $1.2 billion in voter-approved Proposition HHH bond money to help speed up housing efforts. The VA is also exploring temporary housing to get veterans off the street while developers work to fund and construct more permanent solutions. West Los Angeles VA campus (Map: U.S. Department of Veterans Affairs). The VA sits on 388 acres of prime West L.A. real estate, wedged between the ritzy neighborhoods of Brentwood and Westwood. It was initially gifted to the federal government in 1888 to provide homes for disabled soldiers. Not long after the Korean War, around 5,000 veterans called the campus home. But starting in the 1970s, the VA stopped housing veterans on the land. "We had housing on the campus, but then the environment changed, and what we used the land for changed, and it wasn’t for the good," said Ann Brown, director of the VA Greater Los Angeles Healthcare system. What did occupy the campus often had nothing to do with helping wounded or homeless warriors: commercial leases, like a Marriott hotel laundry facility, storage for television sets, and parking for 194 buses by a private transportation company. Seven years ago, the ACLU sued on behalf of a group of local disabled and homeless veterans. 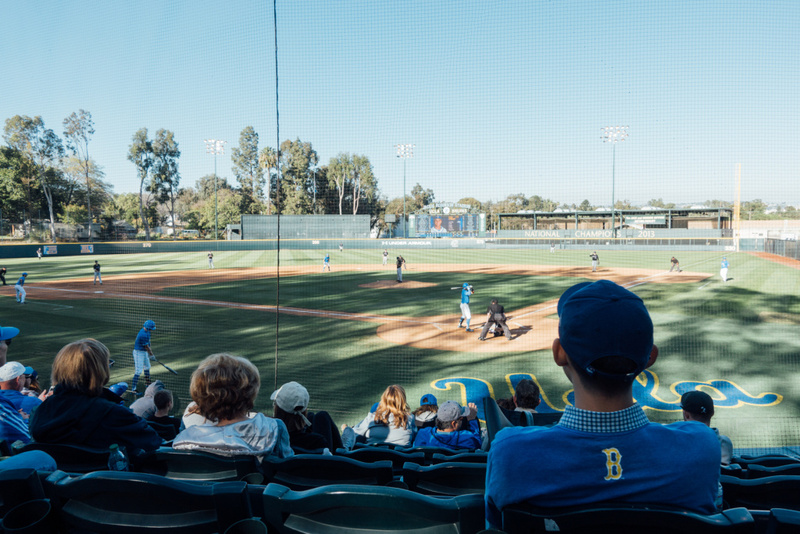 In 2013, a judge ruled nine leases on the campus were illegal, including the agreement allowing UCLA to operate its Jackie Robinson baseball stadium on VA land, and the lease of 22 acres for the private Brentwood school’s athletic facilities. 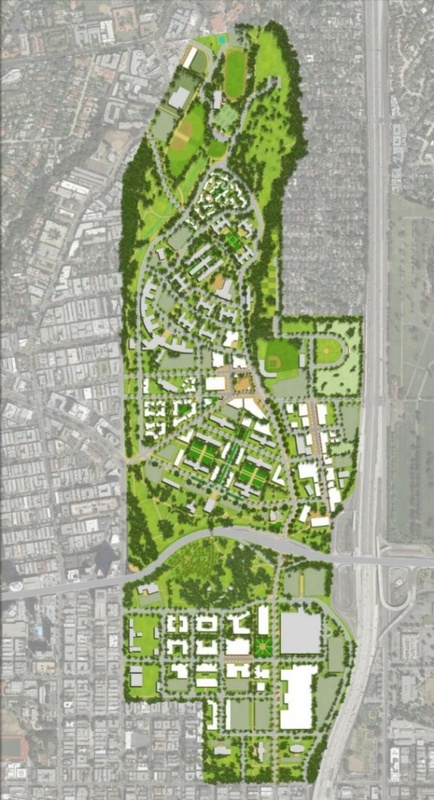 The private Brentwood School leases 22 acres from the West LA VA to house athletic facilities. Reporting by NPR indicated the VA was making tens of millions of dollars on commercial leases, which the agency said was going to services for veterans. Then-VA Secretary Bob McDonald settled with the veteran plaintiffs in 2015, pledging the agency would draft a plan to redevelop the sprawling grounds with veteran care as its guiding star. The goal was to help vulnerable populations of disabled or elderly veterans, as well as female veterans with children. A blueprint was adopted in 2016, known as the Draft Master Plan. It promised radical change across the campus including 1,200 units of permanent supportive housing for veterans, a new 450,000 square foot hospital tower, and the construction of a community ‘town center’ for veterans. "It was really veteran input and the veteran voice that built the Master Plan. Veterans talking about what they needed, and the services they’d like to see," said Heidi Marston, director of community engagement and reintegration services at the West L.A. VA. "We held hundreds of town hall meetings, and received over 1,000 public comments. It was a huge effort." Third party leases that did not meet the goal of veteran care faced ejection from the land. "We did have big problems years ago," Brown said. "How we’re going to overcome those big problems is through transparency, being open with what we’re doing, and asking for help, and doing this in partnerships." In late 2016, Congress returned leasing authority to the VA so the agency could once again engage in agreements with third party developers and service providers to move ahead with the Draft Master Plan, including building housing. 54 veterans moved into the newly refurbished Building 209 last June. It's the first permanent supportive housing the VA has built on the campus and it features stable residences with wraparound social and mental health services. Critics pointed out however that plans to renovate Building 209 were announced in 2007 — well before the Draft Master Plan. The VA finished terminating the last of the bad commercial leases in January 2018, but not before one of the leaseholders, parking lot operator Richard Scott of Westside Services, was indicted for bribing a VA official and bilking the agency out of more than $11 million in parking fees over 15 years. "That really was money that should have gone to take care of veterans. And it didn’t," Brown said, adding the Justice Department investigation into the allegations is ongoing. Some lease agreements were renegotiated. UCLA is still playing ball at the VA, after the school committed to a 10-year $16.5 million deal on the campus. 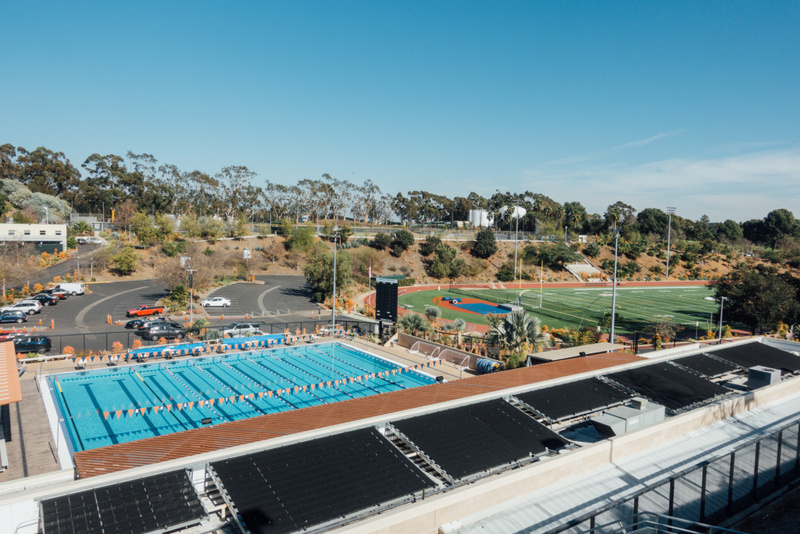 It includes $300,000 annual rent for Jackie Robinson Stadium, and the cost of three new veteran resource centers for mental health and addiction treatment, family wellness, and legal advice, opened last November. A healthy crowd showed up to cheer for the home team at the ballpark last month, including a handful of veterans who can see the games for free. UCLA baseball plays at Jackie Robinson Stadium on the West LA VA campus. Veterans get into games for free. Among the other tenants sticking around: the Brentwood school, an oil well, a city park including a dog run, and a parrot sanctuary. "As we’ve rebuilt the trust with Congress and hopefully the community, we’ve been able to have some of those privileges back," Brown said. "But with that privilege comes significant reporting requirements." "There’s a hodgepodge of different land uses on this campus," said Jesse Creed, an attorney for the original plaintiffs in the 2011 lawsuit and now the executive director of Vets Advocacy, a non-profit formed as part of the VA Secretary’s settlement. "It goes to the fact that there’s never been a systematic, integrated plan of what we’re going to do with one of the most valuable assets the federal government owns." Organizations remaining on the campus have to show they are providing meaningful help to veterans that the VA would not otherwise be able to provide. That requirement is backed up by audits and an annual report to congress. VA officials and advocates involved in this revitalization effort say it’s difficult to overstate the size and scope of the Draft Master Plan’s ambitions for reshaping the West L.A. VA.
"We’re talking about basically building a new neighborhood in Los Angeles," Creed said. The West LA VA houses the largest VA Medical Center in the country. The 388-acre campus sits between Brentwood and Westwood, along the 405 Freeway. Last summer, Creed’s group released a report card blasting the VA for delays in building housing. Vets Advocacy said timelines set forth in the original Master Plan were being extended with little to no explanation. "[C]hange at the West L.A. VA campus is moving too slowly, and the pace of change is slowing as well," read the report. The group pointed out the initial promise of the Master Plan: 490 units of permanent supportive housing opening within 30 months of congress giving leasing authority back to the VA — a deadline of March 2019, which the VA has since revised. The agency emphasizes much of that construction is waiting on the completion of environmental assessments of the campus, with an eye to state and federal regulations. The blueprint is being studied for potential impacts to traffic and pollution, and to make sure the changes comply with historic preservation laws. The VA will hold another round of public comment on the environmental report in late 2018, and it is expected to be completed in summer 2019. Meanwhile, two renovation projects will go forward. A developer and service provider have been chosen for the refurbishment of Buildings 205 and 208, which are slated to offer over 110 units of permanent supportive housing. The VA said those projects should break ground this summer, and open to veteran residents in early 2020. The VA won’t yet put a dollar amount on the cost of the entire Master Plan. The agency says that number is also waiting for the completion of environmental reviews. "This is definitely one of the biggest question marks that everyone is trying to grapple with," Creed said. One refrain you hear again and again from the VA: the agency can’t do this alone. "The VA’s not going to be able to fund this massive project on its own," Brown said. "So we need some creative thoughts and the community to step in and say 'Hey, what if we try this? What if we try this?'" Most steps in the Draft Master Plan related to the medical side of the campus, including construction of the medical tower, building repairs, road work, and various infrastructure projects, will rely on funding through the traditional VA budgeting process, which must be appropriated by Congress. Housing will be built through a public-private partnership mechanism known as Enhanced Use Leases (EULs). Under this arrangement, the VA identifies underutilized land and chooses a third party developer to finance, build or renovate, and operate the buildings, at no cost to the federal government. Advocates, elected leaders, and the VA also hope to leverage state and local funding, which generally moves more quickly than congressional appropriations. UCLA opened three veteran service centers on the West LA VA campus in 2017. Pictured: the Veteran Family Wellness Center. Dollars from an L.A. County voter-approved sales tax hike known as Measure H are already in action on the West L.A. VA campus, subsidizing wraparound services for the small number of veterans living there. 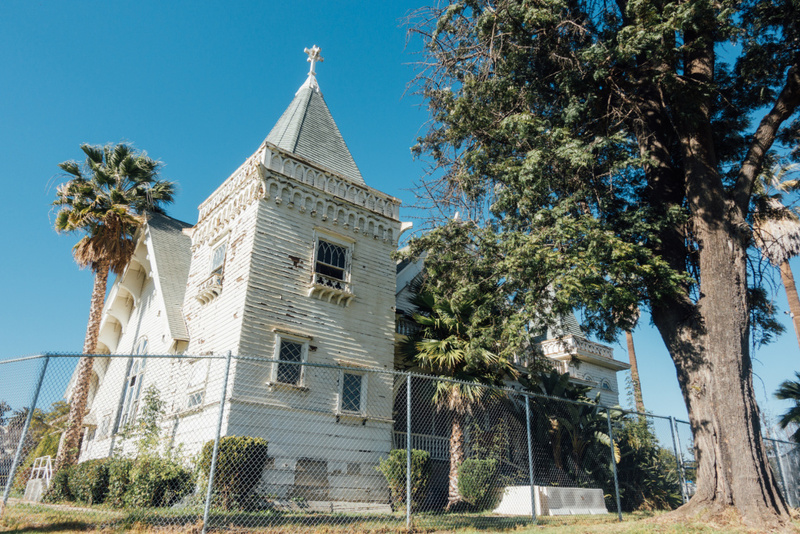 And late last month, the City Council gave final approval to use nearly $24 million of Proposition HHH funding to help with the cost of renovating Buildings 205 and 208 on campus. A development group called Veteran Housing Partners will refurbish the buildings, and the non-profit Step up on Second has been tapped to provide social and mental health services to veteran residents, as it currently does for the 54 veterans living in nearby Building 209. "Housing our homeless veterans must be an urgent priority, and using HHH funds to rehabilitate and open supportive housing at the VA campus in West L.A. is an incredibly worthy investment," said L.A. City Councilman Mike Bonin, who represents the area around the VA campus. Bonin helped push for the approval of the bond funding for veteran housing. "Every neighborhood in L.A. needs to be part of the solution, and I am very proud to stand with neighbors in Brentwood in supporting the creation of more supportive housing on the VA campus," Bonin said. In late January, Meghan Flanz began her tenure as Executive Director of the Master Plan, a new position created to oversee change at the West L.A. VA. Flanz is a Los Angeles native and 16-year Department of Veterans Affairs veteran. Her grandfather is buried at the Los Angeles National Cemetery across the street from the VA campus. ​"Every minute that I spend on the campus, I’m blown away by the opportunities that we have," Flanz said. "I’m not afraid of complex challenges, but I’m a people person. And I feel like the Master Plan is how we take care of people, and in particular homeless veterans." Vets Advocacy applauded the appointment. "We're excited. It'll be a person who can be the center of gravity. They're known in the community as the person responsible for the Master Plan," Creed said. The Wadsworth Chapel on the grounds of the West Los Angeles VA was built in 1900. Flanz said that while the environmental reviews are being conducted, she’s continuing outreach to veterans to hear their concerns about the changes in store for the campus. And she’s listening to surrounding communities, where residents are worried about the implications of new density (i.e. traffic) in the area. "Part of the challenge is how big the property is, and part is the number of people who have an interest in what happens there," Flanz said. In the meantime, "We are looking at innovative ways of getting housing on the campus faster," Flanz said. She added that could include temporary solutions, similar to the temporary 'bridge' housing structures now in place in San Diego. One large industrial tent can house up to 200 veterans daily, with bunk beds, storage, and outdoor restrooms. 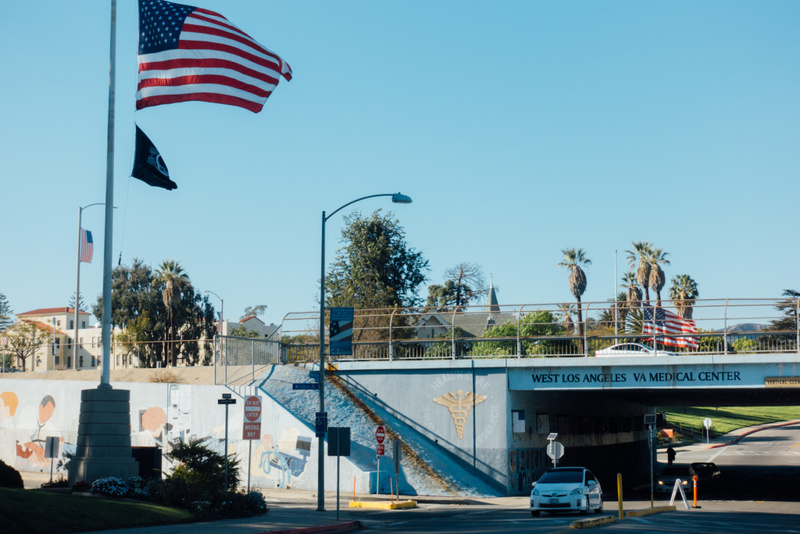 The West L.A. VA is also "actively considering" safe parking programs, which would offer homeless veterans who sleep in their cars a secure place to park overnight on the VA campus, along with access to showers, restrooms, and other supportive services. The City of Los Angeles has increasingly cracked down on car camping on city streets, but some churches around the city are offering their lots for safe parking programs. "We are looking at ways to leverage those ideas, and others, within the legal parameters that VA must follow in assisting homeless veterans on and off our campus," Flanz said. "We need to be working with a sense of urgency about getting veterans housed on this campus."